Dillon Lane Photos, News, and Videos | Just Jared Jr.
Cody Simpson & Jennette McCurdy: 'Bucket & Skinner' Guest Stars! Dillon Lane and Taylor Gray get thoughtful with Cody Simpson in this new shot from Bucket & Skinner’s Epic Adventures. In the new episode “Epic Break-Up”, After Bucket (Gray) is disappointed that Kelly (Ashley Argota) is going to prom with her boyfriend Blake, Skinner (Lane) buys tickets to an upcoming rock festival in San Diego. But when Kelly’s childhood friend Devon (Jennette McCurdy) visits, she causes a rift between Kelly and Blake and later tries to make amends by bringing Blake to prom to surprise Kelly, who must ultimately choose between Blake and Bucket. Matt Shively also guest stars! Bucket & Skinner: Epic Haunting! Taylor Gray and Dillon Lane get their haunt on in a brand-new episode of Bucket & Skinner’s Epic Adventures. In “Epic Haunting,” Bucket (Gray), and Skinner’s (Lane) latest plan to achieve epic status requires them to spend the night in a haunted house! The boys face one terrifying chill after another, until they discover that a jealous Aloe (Glenn McCuen) is behind the whole thing. When the scares continue after Aloe’s plan is revealed, Bucket and Skinner fear the house may actually be haunted. “Epic Haunting” airs TONIGHT @9PM ET/PT on Nickelodeon. Gracie Dzienny goes glam as she arrives at the 2011 TeenNick HALO Awards held at the Hollywood Palladium on Wednesday night (October 26) in Hollywood. The 15-year-old Supah Ninjas actress was not only joined by cast mates Ryan Potter and Carlos Knight, but by Bucket & Skinner too! Taylor Gray, Dillon Lane and Tiffany Espensen all hit the orange carpet to honor those who have given back ten fold. “The Teen Nick Halo Awards were incredible! Congrats 2 the honorees 2night! U all inspire me! Thank U 4 everything U do 2 help the world!” Tiffany tweeted. 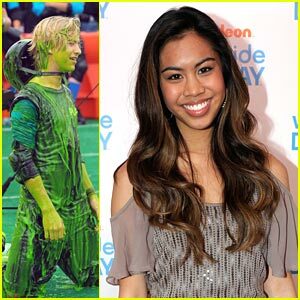 Ashley Argota walks the red carpet at the start of Nickelodeon’s 2011 Worldwide Day of Play held at the Ellipse in Washington, D.C., on Saturday (September 24). The 18-year-old actress was joined by Bucket and Skinner costars Dillon Lane and Taylor Gray. The trio actually had a truly epic time — how epic? They went on a night tour of the capital — on Segways!